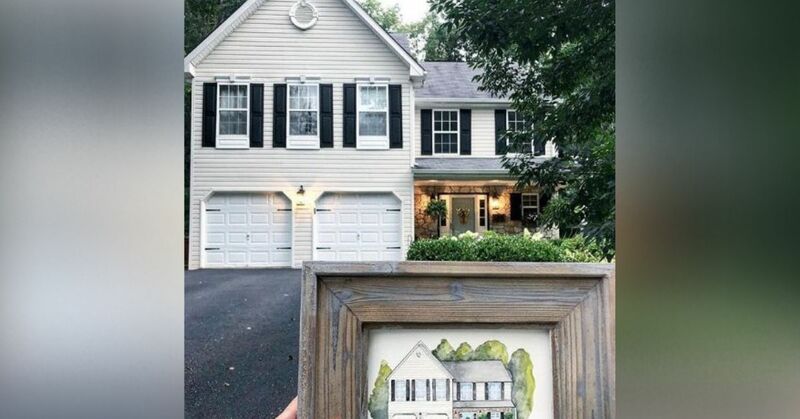 Along with the help of her handyman hubby, Jen is working to transform her family's builder-grade home into a modern farmhouse one DIY project at a time. The Pennsylvania couple have two young boys, so the space must be as functional as it is beautiful. From tackling hefty projects like refinishing a farmhouse table and chairs, to simple upgrades like painting a statement wall, Jen has curated a shabby-chic aesthetic that brings classic farm decor into contemporary times. Jen's favorite DIY in the house is the white-painted kitchen cabinets. It was labor intensive, but created a sleek complement to light stone countertops, gray subway tile backsplash and gray paint surround. A spacious island features a basin sink and large pull-down faucet, as well as an extended breakfast bar with stools for enjoying morning coffee or a quick snack. A DIY barn door completes the aesthetic. In the bathroom, a sage green wall adds a pop of color against white shiplap siding. Twin square vessel sinks sit atop a slate countertop, with brass vintage faucets installed above. Moroccan tile in a rich gray ties the room together. A Pike Place chandelier through Troy Lighting features vintage-style ropes and wrought-iron detail in the living room. Below, a tufted sectional sits opposite twin armchairs for ample seating. In the breakfast nook off of the kitchen, Jen found the table, chairs and bench for a steal on Craigslist, and refinished the tops to complement barn doors nearby. In front of the table, simple shelving offers a display for rotating decor, which is changed out each season. In the formal dining room, a dark table and chairs sit beneath a wrought iron chandelier with candle lighting. A roomy hutch offers storage for China and space to display antiques and other collectables. The master bedroom features a canopy bed anchored by a geometric rug. A moody navy blue accent wall makes the space feel sophisticated, complemented by textural pillows and throws, and gold frames hanging above the night stands. In the older boy's room, a color palette of orange and navy is bright and classic. Tribal throw pillows complement the geometric rug below. A Star Wars theme defines the younger boy's room, where a Rugged Stripes duvet cover is from Linens and Hutch. Wallpaper creates a faux brick statement wall behind the bed, decorated by a gold star hanging above and pillows from a galaxy far, far away. In the guest room, Jen used gold spay paint to transform a vintage metal bed-frame, flanked by matching brass sconces. A black statement wall adds edge to the room's feminine aesthetic. Outside, a dreamy patio is finished in brick underneath strings of cafe lighting. Vintage lanterns complete the glow for an evening spent al fresco. Share this elegant home house with your friends on Facebook.